Looking for the 2019 Transportation Wallet? (Feb. 21, 2018) Waking up to a second day of snow and ice this morning, Portlanders are hopping on transit, strapping on snow boots or riding a bike to get to where they need to go. And now the Portland Bureau of Transportation is expanding its Transportation Wallet service to keep Portland moving, through #SnowJam2018 and beyond. an annual Portland Streetcar Pass. This is a $684 value! A portion of the parking permit fees that NW residents and employees pay go to provide Transportation Wallet's discount. Get your Transportation Wallet today at transportationwallet.com. The expansion of the program follows after a successful launch of the Transportation Wallet in partnership with the Central Eastside Industrial District Council, where PBOT teamed up with the parking district to encourage walking, taking transit, and bicycling in the districts. The Transportation Wallet is a helpful tool for employers and residents alike. The Transportation Wallet is one of many approaches to address parking demand and congestion in these two dense areas of Portland. Switching even just a few trips from driving to other modes creates more available parking and helps alleviate traffic, a win for everyone, no matter how you get around. 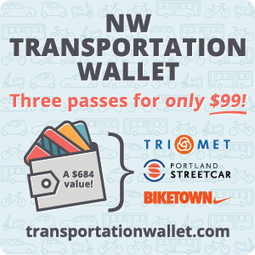 Employees and residents in the NW Parking District and Central Eastside Industrial District can get their Transportation Wallet today at transportationwallet.com.